About five years ago when we lived in San Francisco, I attempted to recreate the cake on the cover of Martha Stewart Living for Ben's birthday. I slaved over a homemade three layer lemon poppyseed cake with glaze, frosting, the works, for 3-4 hours. The result? A cake that was easy on flavor and a little too dry--definitely too dry to enjoy a day or so later and who can eat a three layer cake in one day? I was deflated. Over the years, after much experimentation, I've found that the best cake recipes are those that combine homemade ingredients with cake mixes you can buy at your grocery store. This is one of those recipes. My friend Kristin brought this cake over on Sunday and Ben and I fell in love with it immediately. We also shared it with Ben's parents who loved it as well and requested the recipe. Given its rave reviews I thought I'd share it with you all! 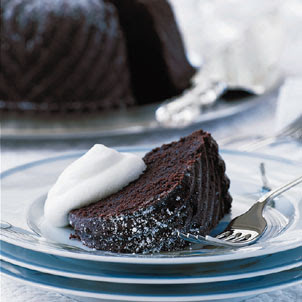 It is moist, full of chocolate flavor, not too sweet and most of all....addicting. Lightly sift a little powdered sugar over it once the cake cools and then serve with homemade whipped cream and berries (raspberries and strawberries are best). Bon Appetit! In a large mixer bowl, combine cake mix, pudding mix, eggs, sour cream and water. Beat on medium speed for 2 minutes. Stir in chocolate chips. Spread batter evenly in prepared pan. Bake 50-60 minutes or until a cake tester inserted in center comes out clean. Cool 25 minutes in pan on a wire rack, then remove cake and cool completely. Mix it all, pour into greased 9 x 13, bake at 350 for 40 minutes (watch it). It is so yummy!